I can still remember some of my friend’s handwriting from middle school. It was inexplicably linked to their persona: the oversized, loopy print to the bubbly, talkative girl; the well-slanted, swooping cursive to an artsy, graceful, introspective friend; and oh! my grandmothers handwriting - how distinct! Looking at old letters - not even reading them, just looking at the script - evokes an almost palpable sense of their personality. Which is why I think wedding guest books are so very important. The personality that shines via distinct handwriting is just so lovely. If you combine that with some meaningful words and well wishes from attendees, you’ve got a package of invaluable memories. That said, you may want to consider something different for your wedding guest book, something off the beaten path. Maybe you’d prefer something to hang in your house, or a game that you’ll break out and use more frequently than you’d page through your guestbook. Whatever your preferences, see if there’s anything below that sparks an idea appropriate for your wedding. Sometimes it’s just hard to think of something meaningful to write on the spot. Let your guest’s imagination run wild by asking them fun questions. Their creative juices will get flowing and you’ll end up with some memorable notes! Every time you play Jenga, you get to pull out your guests messages one by one. 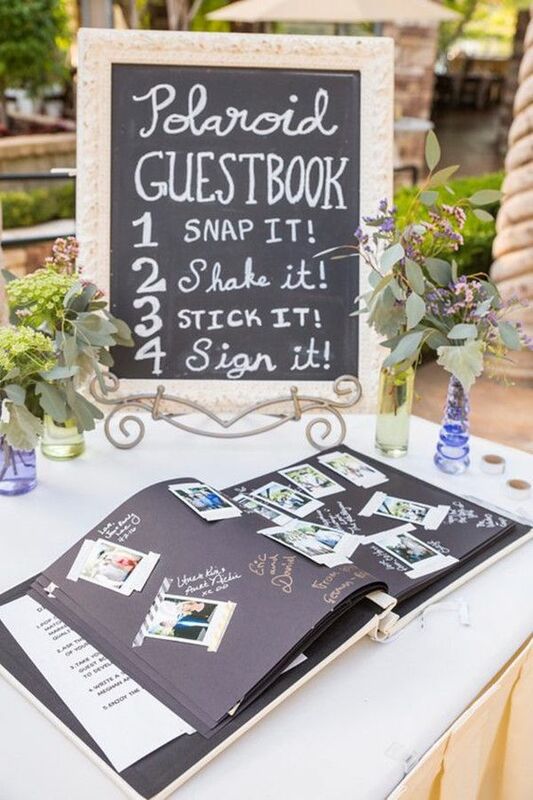 With a couple Polaroid cameras and plenty of film, guests will have fun taking photos of themselves and adhering them in a photo album along with a message. Get ready for a slew of hilarious selfies. How fun is this? Have guests write a well wishes, a joke, or even predictions on notecards, and then insert them in the piñata. You’ll have the ultimate 1 year anniversary activity when you bust it open to reveal all the notes from your loved ones. Are you a music buff? Grab an LP (or 4!) of a song that is meaningful to you both and have your guests sign away. Choose your first dance song, maybe a song that was playing when you met, or the song that was playing when you walked down the aisle. They’ll look great framed on your wall. Compile your favorite photos from your engagement photo shoot into an album that your wedding guests can sign. 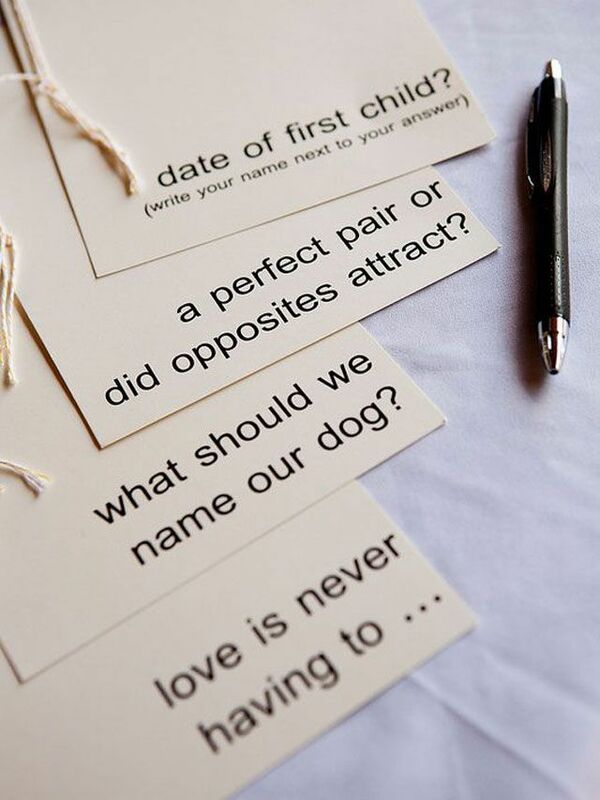 We love the idea above where the couple asked their guests leading questions to answer. Smooth river stones provide an adorable place for guests to write you notes. You can keep them all together in a glass container, spread them throughout your house, or even sprinkle them in your garden. Transform your favorite coffee table book into a book of sweet notes from your loved ones. 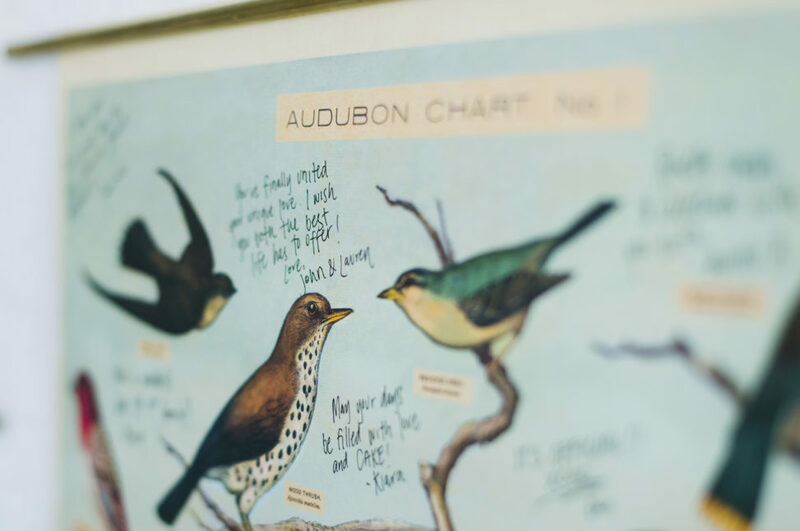 This wedding guest book is guaranteed to stay out and be enjoyed more than most. 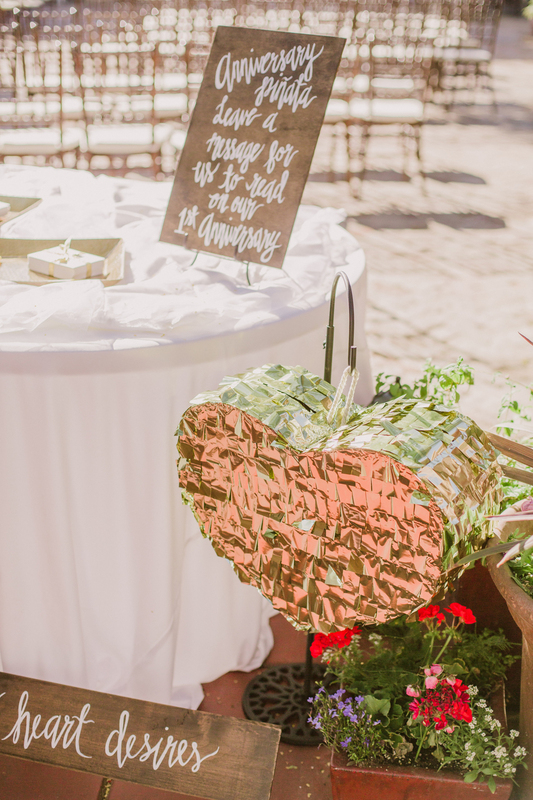 Keep the romance alive with help from your guests. Have them fill out cards with their favorite date ideas and well wishes. Thinking of a new creative date idea will no longer be difficult! How fun is this? Document how the stars aligned on your wedding night, or on multiple milestones in your relationship. If you are adventure seekers who love traveling, or just love a good globe in your decor, have guests sign their wishes on the globe. The only question is, where in the world will they sign? Another idea for all you serial travelers out there: have guests sign their well wishes on their favorite country in an atlas. A vintage atlas is a beautiful book to display, and now yours will be full of sentimental notes. We’re guessing you may keep this hanging a bit longer than alternatives if you choose a print that coordinates with your decor. Keep it relevant by choosing a subject matter that means something to you both.